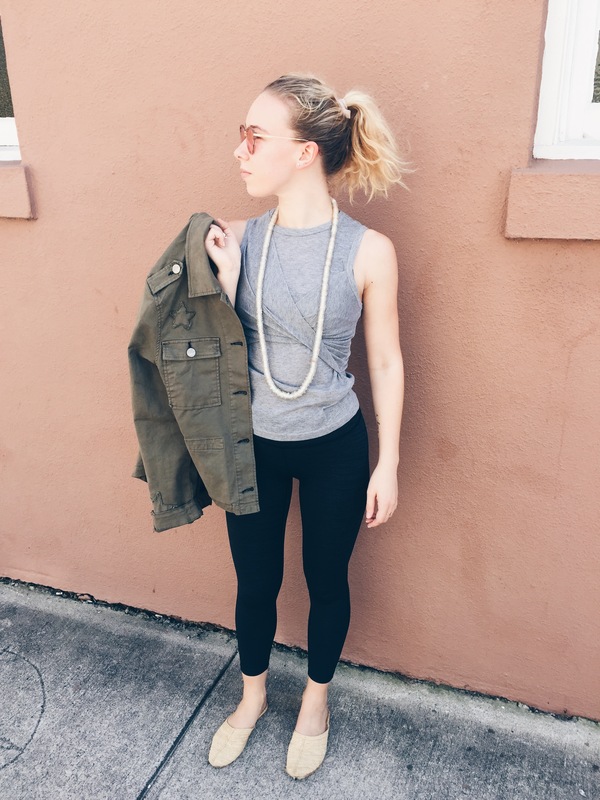 Beckett Boutique | King Street, Charleston, SC » Working out, or just Working it? Working out, or just Working it? Want to be well styled and comfortable as you run out to conquer your day? Enter Athleisure. This hybrid of casual + athletic threads has gone from a new trend to a lasting category of clothing that seems here to stay. From carpool pick up lines, to casual coffee meetings, women are opting for this sporty approach to fashion outside of the gym. Ok, so we really don’t encourage you to wear yoga pants everyday (or you can’t sit with us), but there are clever ways to mix stretchy performance fabric into your everyday style without looking like you dressed for a workout that you never actually accomplished. The beauty of athleisure pieces is that you can pair them back to casual clothes in a way that makes sense to wear to social gatherings, travel, and even some office settings. However, there is a fine line between full on “I just left yoga” and casual friday at work. Insider tip: don’t go too literal in your active style (unless of course you are actually hitting the gym), instead take the latest trends of the season and mix them into your sporty ensemble to create a casual masterpiece. Picture this: you have one million things to do today, starting with coffee, followed by shopping, walking the dog(s), then finally grabbing the kiddos from school. This kind of a day calls for a well styled casual look (in case you run into someone you know, duh! ), but also an outfit that is functional and washable! These black joggers and knotted pink tee will score you nods of approval from fellow fashionistas while making your hectic day a little more comfy. They look like denim, the are in fact made of denim, but the FEEL like yoga pants. These high wasted little gems are a Beckett Best Seller and they come in a ton of colors and washes. Move effortlessly through your day as if doing a “Vinyasa Flow” while you work! If you have not treated yourself to a “fashion” sweatshirt, stop reading and come to Beckett immediately. This is Beckett Babe A’s favorite athleisure trend hands down. Beyond the soft and cozy factor (which is insane) the silhouettes of these new age sweats mirror the design of trending tops (i.e. : open shoulder, ruffles, and cut outs). We now live in a world where sweatshirts have become high fashion; please turn and fist bump your neighbor. Ok yoga pant addicts, this one is for you. Step one, find a simple yoga pant that has minimal detail and logos. Step two, throw on a top made of a casual fabric (ribbed knit seen here) that is not a work out top. Step three, grab a casual jacket that you would normally pair with jeans. Step four, throw on one piece of jewelry, whether a statement necklace, an cool-girl arm party, or a fun earring. Treat your yoga pant as if it is your most casual skinny jean. The blend of all these fabrics with the pop of a simple accessory is what athleisure is all about. Replace your classic white or gray tee with a soft blush to keep your sporty vibe fresh and on point. We layered with some stripes to bring in a little pattern in a subtle way. Throw your work out tank under the tee for more layering greatness! Throw on a hipster trucker hat from a brewing company, Dolce Vita sneaks, and a Dwight coffee mug and you have a happy Sunday! Or is that just us….? The top and pants however are universal – due to the fact that they are light, breathable, and butter soft! Don’t know what butter soft means? Come try them on and never take them off! Got your wheels turning? Taking a look from the studio to the street does take some thought, but we are up for the challenge. We have a plethora of new arrivals that seamlessly blur the lines between the locker room and your everyday style. Hope to see you Beckett soon!